(T/MC) available to Chicago and the world. The T/MC was conceived in 1993 and launched in January 1994...25 years ago! To make contribution, go to bottom of this page and use the PayPal button. We all want same long-term result of kids moving safely through school and into adult lives and jobs. Read this article to see how the Tutor/Mentor Institute, LLC and T/MC support this goal with an extensive knowledge base. Read other articles from the Tutor/Mentor blog and the presentations in the library on the T/MC web site. Do you find anyone sharing these types of ideas in Chicago or another city? If not, then help Dan continue to do this, and help him do it better. Listen to 2018 podcast interview. Look at the other "intermediaries" in Chicago and around the country. Do they offer the same range of resources and ideas? Have they been doing this for over 20 years? 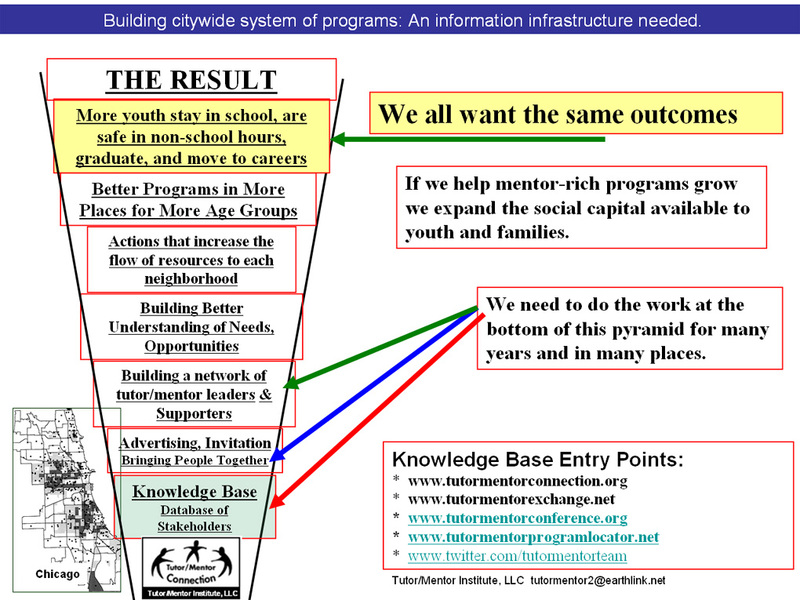 Rather than trying to be the single leader in a huge city, the T/MC and now T/MI, have sought to provide an information platform that all leaders can use to innovate ways to support tutor/mentor program growth in more places. While there is one map for Chicago there are thousands of leaders. These are two resources that need updating and new energy. View videos on YouTube video list. More on this YouTube channel. More here. The Tutor/Mentor Connection/Tutor/Mentor Institute, LLC is ill and needs your support to get better. I'm not a 503-c-3 non profit, but also have not generated revenue to pay bills consistently since 2011. This blog article focuses on "why I keep doing this". I hope you'll read it. If you support this goal and recognize the 24 years of work, and the VISION of Dan Bassill, founder of the Tutor/Mentor Connection and Tutor/Mentor Institute, LLC, with a 2018-19 gift of $25 or more. Become a volunteer, advocate and/or partner and help Dan find sponsors, investors and partners to build this platform for future use.